>VCCA France is a go! The last several days have been hectic. 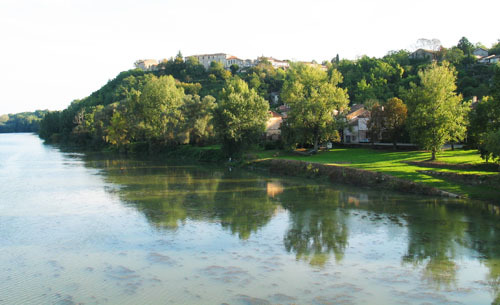 Midweek I learned that I might be getting a residency at VCCA’s facilities in France: Moulin à Nef, in the village of Auvillar. Trying to make that happen was stressful–the residency available was almost 4 weeks, and adding in travel would have been almost a month. That’s a long time to be away–from the garden, the dog, the house, other responsibilities (which is the POINT of a residency, of course, but the thought of it was a little overwhelming). So I said no. But then the next day a much shorter residency opened up because of a cancellation and I grabbed it. Then it turned out I have a possible house-sitter (and dog-sitter), so I could be away for a couple of weeks without worrying too much. So that much was decided by Thursday night. On Friday I headed to Chicago for my niece’s wedding–although there were some horrific storms during the weekend, none of them disrupted any of the festivities, some of which–including the ceremony–were outside. Lots of fun, and I met lots of family and friends of my new nephew-in-law. Today I’ve booked a flight (I decided to skip Paris on this trip, as much as I enjoy it) direct to Toulouse, where I’ll explore for a few days before going to to Auvillar. I even booked a hotel. Really the last bit will be to figure out the train schedule from Toulouse to the nearest train station and book that. And then I’ll be [mostly] all set! >Congratulations! Hope you have a fun and productive time. >I was there two years ago and i was impressed. Unfortunately i had no time to visit it very well because i was there for only two days, but i hope to visit it again very soon. I recommend this place, it is very nice. >Ok Cliff–Can you explain to me where I can get more info on this VCCA program? I don't even know what VCCA stands for so I can't look it up on line. And bon voyage! Can't wait to hear about your experience. >Margaret, VCCA is the Virginia Center for the Creative Arts, an artists' colony near Amherst, Virginia. The program in France is related, and you have to have been a Fellow in the Amherst facility before applying for France. But go to the website for VCCA and click on international programs.